I have these 5 dolls. They appear to be a father, mother, daughter, son, and an infant daughter. Their heads and necks are made of the same material (I'm thinking bisque, but not sure) and their bodies are a foam wrapped in some type of cloth. 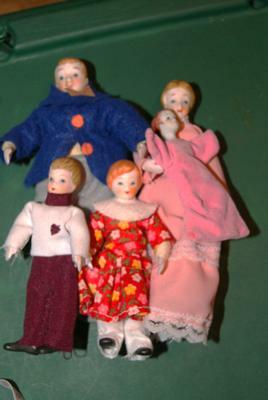 Their hair is molded on and their clothes are sewn so that they won't come off, not to the dolls themselves. I can't find any markings at all on them. The parents are about 6 inches tall. The daughter is about 4 1/4 inches. The son is about 4 inches. The infant daughter is about 2 3/4 inches to the feet but are sewn into a sack like outfit that makes the doll seem about 3 inches long.